Even though Mexican Americans and Mexicans share common cultural roots, Mexican Americans are not as heavily Catholic as Mexicans. In addition, Mexican-American Catholics hold less traditional views on some core Catholic teachings than do Catholics living in Mexico. According to the U.S. Census Bureau, about two-thirds of U.S. Hispanics – more than 20 million adults – are of Mexican descent. Many of these Mexican Americans were born in Mexico, carrying their language, culture and religion across the border. In terms of religious affiliation, however, there are significant differences between Mexicans and Americans of Mexican descent, according to two recent Pew Research surveys. Majorities of both groups self-identify as Catholic, but the percentage of Catholics is 20 percentage points higher among Mexicans (81%) than among Mexican Americans (61%). Meanwhile, more Mexican Americans than Mexicans are Protestant (18% vs. 9%) or unaffiliated with any religion (17% vs. 7%). Even among Catholics, the two groups espouse very different views on some church teachings. For instance, Mexican Catholics are significantly less likely than Mexican-American Catholics to say the Catholic Church should allow priests to marry and women to be ordained as priests. Indeed, just 31% of Mexican Catholics favor changes to church policy on the priesthood – that is, allowing priests to marry or women to become priests. 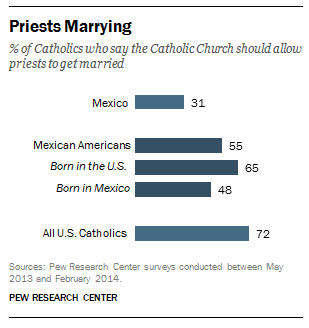 By contrast, about half or more of Mexican-American Catholics say that priests should have the option to marry, and that the priesthood should be open to women. Mexican-American Catholics who were born in the U.S. are especially likely to support changes to the priesthood, with about two-thirds saying that priests should be able to marry and women should be able to become priests. Whether or not these levels of support for change among the American-born reflect the impact of acculturation, these percentages are roughly comparable to the corresponding shares of U.S. Catholics overall who favor these changes (72% and 68%, respectively). 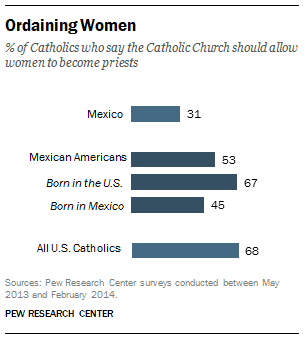 Even among those Catholics who were born in Mexico and who later emigrated to the United States, about half say Catholic priests should be allowed to marry and 45% say they support the idea of female priests – both significantly higher than the roughly one-third of Mexican Catholics who voice each of these opinions. At the same time, Mexican and Mexican-American Catholics do exhibit similarities in some areas of religious practice and belief. For instance, they attend Mass at about the same rate, with roughly four-in-ten in each group saying they go to church once per week or more. Large percentages of both groups also support reversing the church teaching that prohibits divorce and the use of artificial birth control. For example, 66% of Mexican Catholics and 72% of Mexican-American Catholics favor changing the church’s teaching on birth control. Juan Carlos Donoso is a research associate focusing on religion at Pew Research Center.